Do you ever find yourself getting jaded with music? Struggling to find something new that moves you? I certainly have, and discovered that the answer is to go back to an album that works as an aural sorbet; cleansing my musical palette and getting me back to square one. 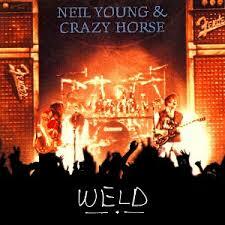 The album in question is "Weld" by Neil Young and Crazy Horse. This was the first Neil Young album I bought after hearing "Rockin' In The Free World" and "Like A Hurricane" on the radio. This was in early 1991 and was the first time I'd come across Neil. After going into HMV I looked for the CD that had both of the aforementioned songs on it. Until "Greatest Hits" came out in 2004, this was the only way to get both tracks one album. From the punk response of, and soon to be tragically quoted, "Hey, Hey, My, My (Into The Black)", to the country 'trash' of "Roll Another Number (For The Road)" I was captivated by this both simultaneously classic and strange music. It wasn't polished and it was certainly rough around the edges. It quickly became my favourite album of all time, with a mix of raw power, noise and great songs that I found intoxicating. It sparked a rapid journey through Neil's extensive back catalogue, which whilst eclectic at the time, hadn't yet suffered the bloat of too many underwhelming albums that has come in recent times. I'm not trying to claim that it is his best album, but best, (either "On The Beach" or "Tonight's The Night" I'd say), and favourite aren't necessarily the same thing. I still go back to this album whenever I feel the need to remind myself what inspires me about music. I am alone in this habit or does anyone else find that it, or something similar works for them?